Coming into the mobile market, Infinix introduces different series of smartphones which includes the Infinix Zero series , Note Series , the newly released Smart series and finally th most poular series the Hot Series. A lot of device have been launched under this Hot series, in the early days of the year 2017 the Hot 4 Lite and Pro was launched and here we are again in august 2017 the hot 4 receive an upgrading storming the mobile market with the great Hot 5 and its sibling. Infinix Hot 5 Review, Specification, and Price in Nigeria. Infinix Hot 5 is the successor to the Infinix Hot 4, this fifth genertion of the hot series packs a powerful battery, fingerprint scanner andthe latest Android version 7.0 (Nougat). Infinix Hot 5 is a 5.5-inch HD IPS Capacity Touchscreen featuring Full HD resolution of 1280 x 720 pixels just like its predecessor. It measures 154.8 x 77.7 x 8.35 mm and a display colour up to 6 million.though the hot 5 screen resolution is still the same thing has the hot 4, the design is upgraded to a sleeker design, It is neither too bulky nor too thick giving the device a premium look, it is built with a blend of premium materials, plastics chassis with curves on the edges with little bezel to the side making it handy and light. Infinix Hot 5 is equipped with bright 8 Megapixel rear camera with dual Led flash, Phase Detection autofocus, HDR and HD video while the front camera features a 5MP camera for selfie lovers to take a shot at any lightening condition thanks to the flashlight. Infinix Hot 5 is powered by MediaTek MT6580 chipset, coupled with Quad-Core1.3ghz CPU and Mali-400 graphics which helps produce an optimum performance with less power consumption & more which helps the device to work very fast. Infinix Hot 5 runs on Android Os version 7.0 Nougat which is the latest, fastest and a user-friendly Android version and it helps sustain the battery capacity of the device as well as the operation and it also includes practical features such as an integrated Avast virus scanner and topped with Infinix’s XOS UI 2.2 version . Infinix Hot 5 comes with 2GB RAM and packs 16GB of internal storage that can be expanded up to 32GB via a microSD card which is enough to store any document. Infinix Hot 5 is powered by a Non- removable 4000 Li-ion Battery which can keep the user busy for at least 13 hours for watching videos and surfing the internet and thanks to the OS and processor the device does not drain the battery fast. 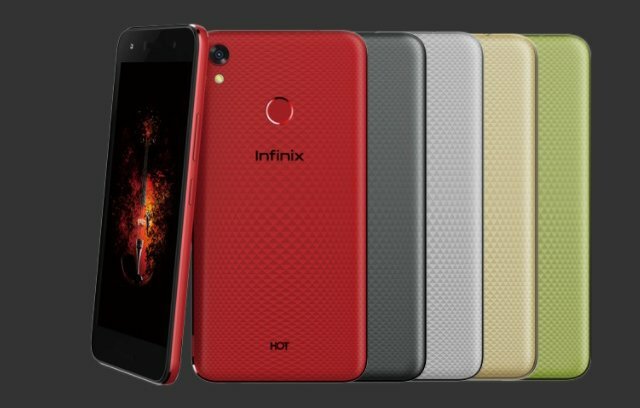 Where To Buy Infinix Hot 5 in Nigeria. Looking for where to buy the Infinix Hot 5 in Nigeria ?. It is very simple and stress-free, to avoid buying the refurbished product, the best option and the smartest move is to order from an online shopping store. The best online shopping website to buy your Infinix Hot 5 is Kara.com.ng. where you can order your preferred series at the best selling price in Nigeria and also enjoy fast delivery to any location in Nigeria.